I love the green. Especially against the black. that color is lovely on you! I also think that's so cute to get a bow ring and nautical ring like that! I love this color too, except I called it forest green. :) Love this outfit. Such beautiful photos, green looks remarkable on you! Can't wait to check the mail in a couple of days! So excited! fantastic color on you! you look great. i swear, you're gorgeous. :) this color is fantastic on you. i love the little collar peeking out! you are so sweet! I love the collar, its so dainty and cute :) i LOVE the last photo so much! This green LOOKS fantastic on you! I love this outfit! The colour really suits you. oh wow, this look is so simple, but so put together. i really love it. and that green looks stunning with your eyes and complexion. One of my favourite outfits! I think it's so schoolgirl color and suits you so much! Lovely detail the lace blouse ;) and little bows in hair, so perfect!!!!!!!! I LOVE this outfit and the photos are lovely! Green is one of my absolute favorite colors and I just don't own enough of it - I really love this, the color suits you and the little jacket is wonderful! That color looks phenomenal on you, and I adore that blazer! It's got such a fun cut. very true--evergreen is a perfectly appropriate winter color :) i love the little collar peeking out! 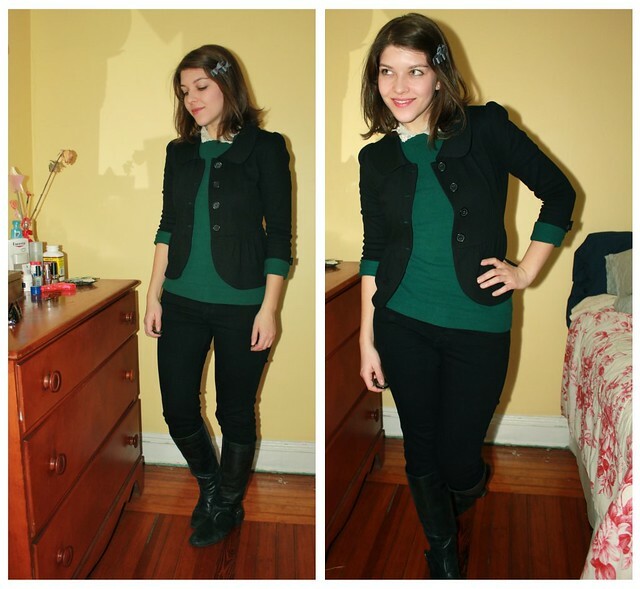 I really love the combination of your blazer and this amazing green sweater! um. you're gorgeous. AND i'm in love with those outdoor photos. green looks amazing on you so please keep wearing it and I love the cut of that blazer on you. Stunning! Green looks fabulous on you. And it reminds us of nature, which is nice in winter. Great choice by you. 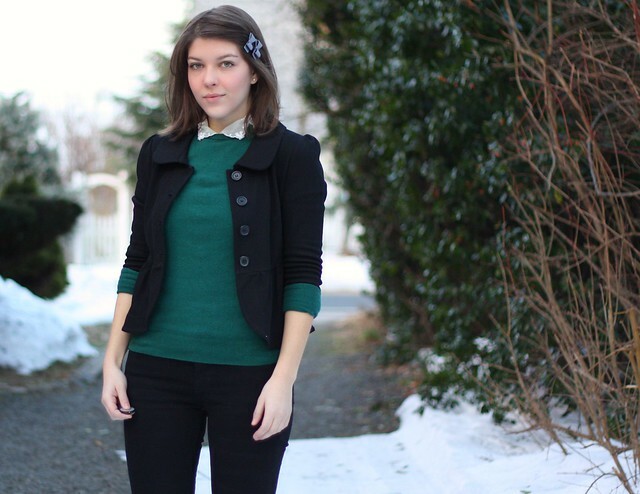 the blazer and sweater look really cute together - and you're right, green is the perfect colour for this time of year! Dark green looks amazing on you! It really brings out your eyes and skin tone!! You should def keep wearing it! Wow these photos are gorgeous Kallie! I'm glad you fell in love with a color that compliments your eyes, it really works for you. I have have some "spruce green" tights from We Love Colors...I haven't worn them yet, but this is great inspiration! You are so pretty! Adore your entire outfit as well. Those bow clips are super cute, and I've been drooling for peter pan collar top lately! dark green suits you splendidly. You look so pretty in this color! I've been wanting more green all Fall (& now Winter) but I've been on a no spending kick. I'm going to Boston this weekend with my cousins & I'm totally gonna keep my eye out for some. I love your lace blouse. That first photo is just gorgeous! Another post of yours going to my tumblr! I love it. Deep dark green is one of my favourite colours to wear, especially in winter. Ha en fin kväll nu hjärtat! Green really does suit you perfectly! I have troubles with it myself. I am usually attracted to colours that suit me luckily, but I adore this colour so much i'll have to make it work! Your bows are adorable! And green looks amazing on you. I love dolce vita!! Their shoes are amazing! LOVE this outfit so so much! those bows are adorable!